This brand is mostly known for their skins, but they’re venturing into hair now, and they’ve launched a small collection of hairstyles this past weekend. I tried on all three new hairstyles, but settled on this long gorgeous styled called Fredja. Each hair pack is $250L, and the fatpack is $900L. I like that there’s only one Blonde pack, so I get all 8 Blonde colors with a single purchase. G-Field is having a Sweet Heart Hunt (ends February 14th), you can score lots of Valentine themed goodies! Search for a teddy bear. I love the outfit I made using a mix of free (hunt) items and some purchased items. 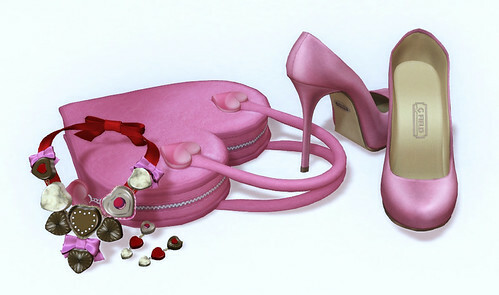 If I went on dates in SL, this would totally be my Valentine’s day “date” outfit. It’s cute cute cute and oh-so-pink (the best color in the world)! You reinvented that *G Field* dress with such a fabulous necklace set. So beautiful. adorable. I’m not a big valentines day person but these are great finds! I so love the donna flora necklace, Just been to the shop but cant see it any where 🙁 is this a event item at all ? Vive9 hair is sooo nice! I cannot find the necklace/earrings ANYWHERE at Donna Flora – any help would be greatly appreciated! Totally adorable! I just want to eat the jewelry! ha! Great post, Gogo. I was totally not feeling the Vive9 hair but seeing it on you is making me want to try it out! =) Have a happy V-Day.